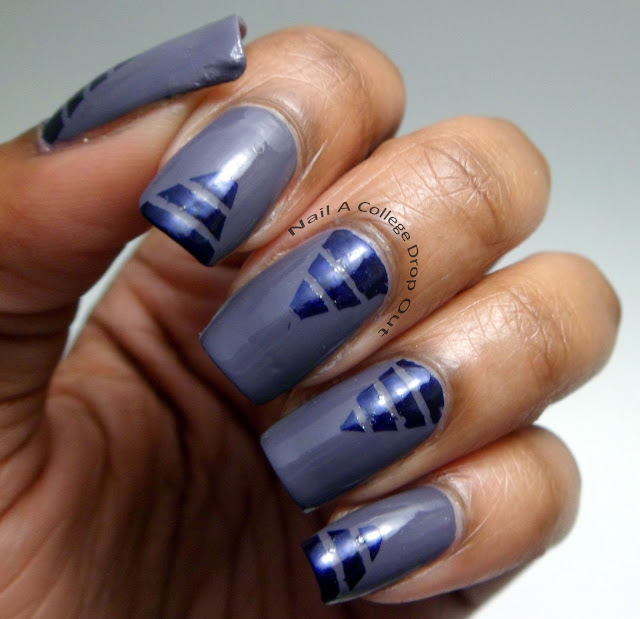 Nail A College Drop Out: Triangles Made From Stripes? Yes. Ah, here I am writing another post at 2am. When will I learn? Probably never. What do I have planned today? Some simple, but awesome nail art using stripping tape and some Dazzle Dry products. I used Dazzle Dry Anticipation as a base color and then applied Dazzle Dry Top Coat. After roughly five minutes passed I added a few pieces of striping tape and painted what would have been actual triangles with A Night To Remember. Finally, I removed the tape and slapped on another coat of Dazzle Dry Top Coat. Tada! To read my full review on the entire Dazzle Dry 3 Piece Kit click on the photo below. Anticipation & A Night To Remember are part of Dazzle Dry's Night Life Winter 2012 collection and retails for $9 each. The Dazzle Dry 3 Piece Kit retails for $28.50--all products available on DazzleDry.com. I don't know about you, but I'm definitely itching to see some summer collections already. The brighter the better! I love the base color you used! Great nail art!